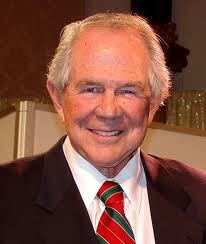 Pat Robertson is once again in the news. After Saturday Night Live poked fun of Tim Tebow’s outspoken faith by parodying a visit by Jesus to the Denver Broncos’ locker room, Robertson saw the need to defend the star quarterback. Robertson was offended by the skit and cited it as an example of “anti-Christian bigotry.” He then added that if a similar thing had been done in a Muslim country there would have been an outbreak of violence (Read CNN’s report here). The first thing to note about this incident is how easily offended we can become once we fall into the “culture warrior” mentality. If we are in a battle for the direction of the culture, we see every joke, jab, and pun as an assault on everything we hold dear. If, however, we view ourselves as ambassadors of Christ, instead of culture warriors, we will better understand that everything we do reflects on our Savior. And being offended at every cultural shift or time we get made fun of does not reflect well. It reeks of immaturity and self-righteousness, not love and concern. Also, Robertson’s indictment of Islam, while most likely accurate, is completely irrelevant. We can only assume that Robertson is not advocating for a similar response by Christians, so what was his point? The truth is that one of the best apologetics for Christianity over and above Islam is that our religion does not condone violence in response to incidents such as the SNL skit. What should separate us from all the other competing world views is the fact that we turn the other cheek when attacked or made fun of. It would be wonderful if we all would lay down our culture war weapons and instead show the love of God to all.